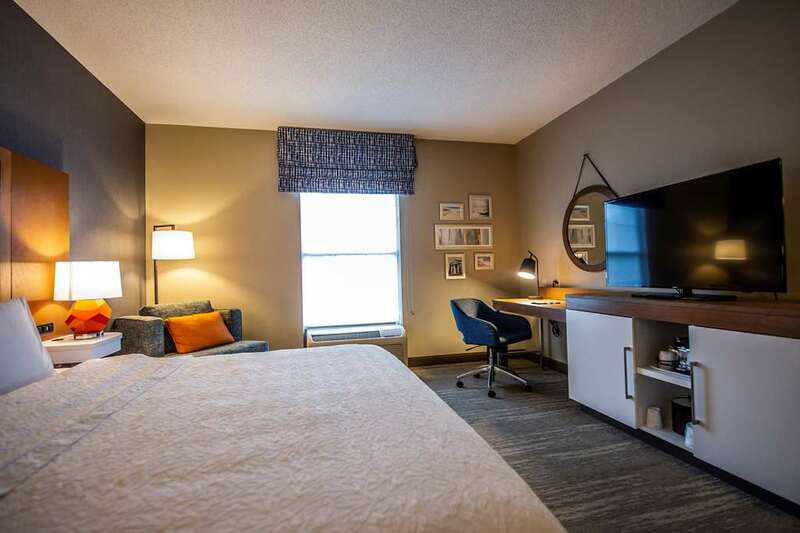 This hotel is 100pct non-smoking The Hampton Inn South Kingstown-Newport Area Rhode Island hotel offers the finest accommodations in the region. Enjoy our oversized indoor pool and whirlpool after a workout in our state-of-the-art fitness center here at the Inn South Kingstown-Newport Area Rhode Island hotel. The area near the Hampton Inn South Kingstown-Newport Area Rhode Island hotel has numerous restaurants with water views of Narragansett Bay featuring fresh seafood that the area is famous for. If you prefer take a stroll over to the shops and dining located on-site in the Commons. While you are here at our Hampton Inn hotel relax on miles of sandy beach ride a handcrafted horse on the Flying Horse Carousel go back in time to plantation life in the 1600*s at Smith Castle whale watch or go deep sea fishing in the port of Galilee or head out to one of the 18 beautiful golf courses. The hotel*s location is ideal for both the business traveler and vacationing families. Whatever it is you decide to do - start off the day with the hotel*s complimentary On the House hot breakfast served every morning in our beautiful mahogany fireplace lobby. The Hampton Inn South Kingstown-Newport Area Rhode Island hotel*s friendly and knowledgeable staff is ready to serve you. We love having you at the Hampton Inn South Kingstown-Newport Area Rhode Island hotel. SBC Southport Brewing Company: Family restaurant - Restaurant is located within walking distance from Hotel*s front door.